EPOS systems are dire need of hour for retail business as this business demand high level of accuracy and integration if one got good combination of hard ware and soft ware of EPOS system as per their needs as every business has completely different set of requirements. 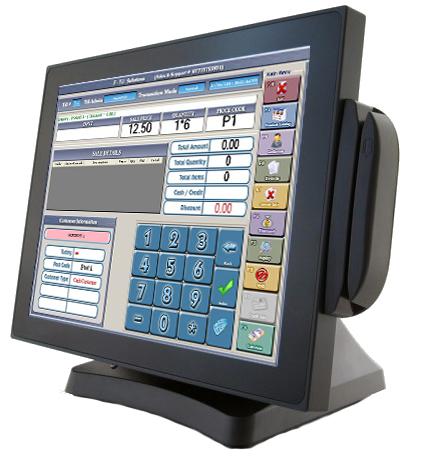 The EPOS system developed by E-Till EPOS system for retailers is easy to use and multipurpose. 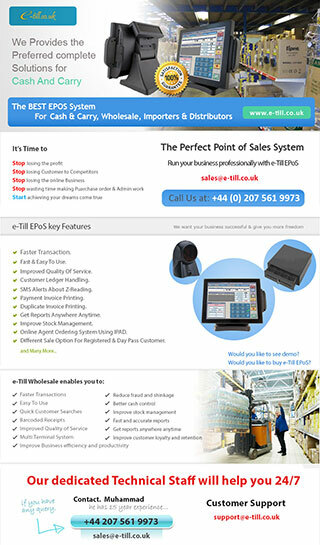 Our EPOS system is rightly known as sales generator as it boosts your sales volume and multiplies your profit. Speed and reliability of service are also important aspects of our EPOS system and the ability to add more features seamlessly is always a handy feature. This EPOS system that is easy to learn and simple to operate will increase efficiency in terms of sales and many other aspects of running your business. Control your business From anywhere in the world. Just Scan The Barcode & Product Will Automatically Added into Your Till. Apply Your Selling Price & Start Selling.. Continuous Growing Data of Millions of Retail Products From Every UK Supplier. Different Sale Option for Registered & Day Pass Customer. Online Agent Ordering System Using IPAD. Automatic Brochure Creation With Pictures in PDF. Till Readings (D-Reading, X-Reading & Z-Reading). Customer Price List System to Assign Different Prices According To Your Needs. Email Broadcast System for Email Marketing To Customers. Intelligent Purchase Ordering System for Save a lot of money while purchasing a product that has more than one Importers / Distributors. Accounts System to handle Purchases & Payments.